In a twist on the usual practice, the artists have installed Housed: without curatorial input – for the curators to come in later and test the limits of the concept of the show as well as the relationship between maker and curator, by re-hanging the show, hoping to offer a fresh perspective. The afternoon session begins with a meeting between the 4 curators and a few of the artists, to revisit the concept (and to provide some technical input on some of the works that may require some instruction/advice). The curators rehang ‘Housed’. Photo credit Louise Wheeler. And the curators just got on with it! Here Oxana and Fabi are working with placement of Saeideh’s photographs. Then they move on to re-stage Regan’s video and Joe’s painting. What the curators have done will be a complete surprise to the artists coming in the next day. Donald Smith, head of the MA Curating & Collections and Director of Chelsea Space, with Stephen Wilson, head of MA Critical Theory, join us the morning of 8 April 2015 for a walk-through and crit of Housed:, providing valuable insights and feedback on the project – before the curators come in to re-hang the show. Crit with Stephen Wilson and Donald Smith, ‘Housed:’ at Chelsea College of Arts, London. Photo credit Regan O’Callaghan. Discussion started out with an introduction by Alex and Regan about Housed: – what we were attempting to do, and what we hoped would be the outcome. How did we curate/ site the works? Was this seen as an Academic research project or a studio/exhibition opportunity? How do you house your practice in different situations? It was suggested, as an artist, one must figure out how to “house” your practice in each situation, in each site, or each exhibition – consider there is no one way to “house” your practice, house your work. Following the group discussion, each artist had the opportunity for some individual feedback (which I won’t get into here). All in all, it was an extremely valuable and enjoyable day. Donald also referenced the book: “the complete curator” (a title I can’t seem to find?) But I did find this instead: A Curator’s Bookshelf on artbook.com). 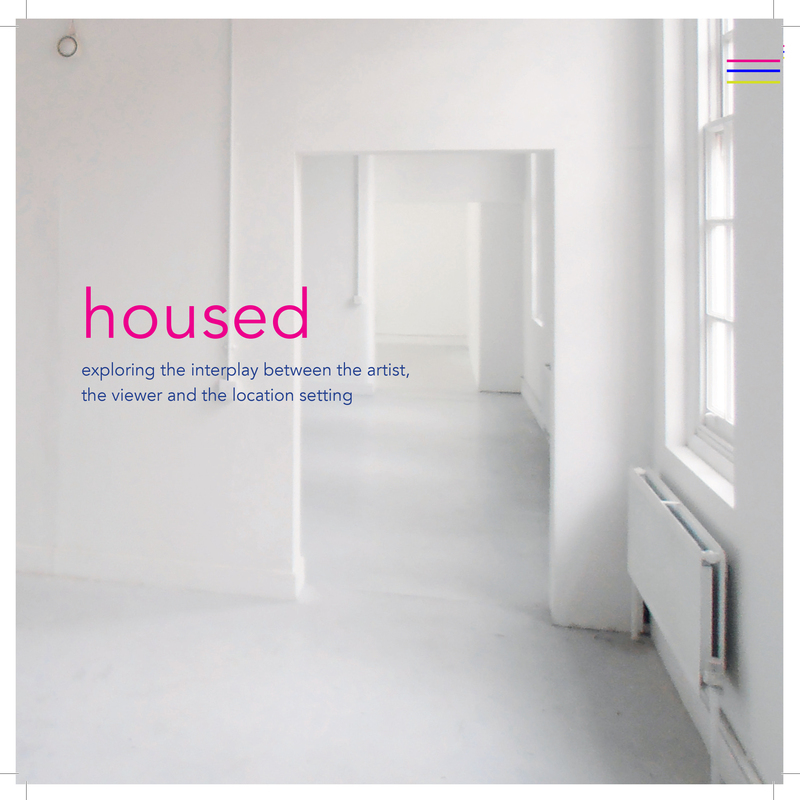 Read more about Housed: on the project blog. Thanks from the Housed artists to Donald Smith and Dr. Stephen Wilson for their time and generosity in sharing their critique with us. 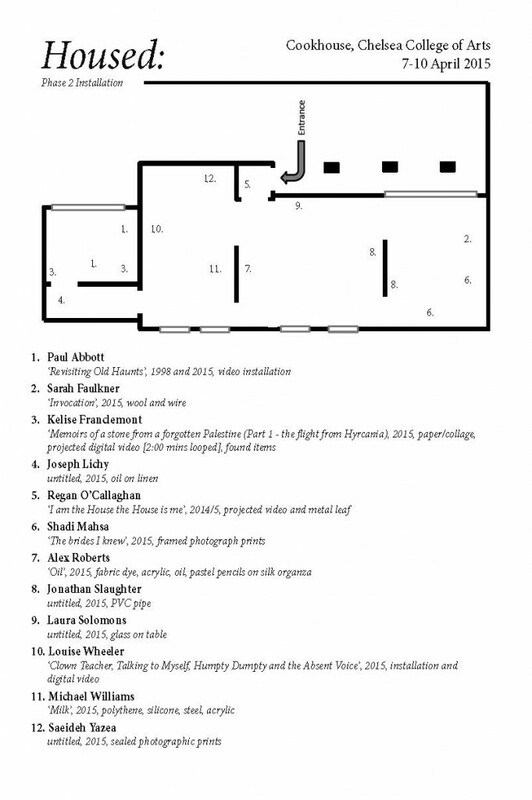 7 April 2015 – Housed: and ready for the curators! 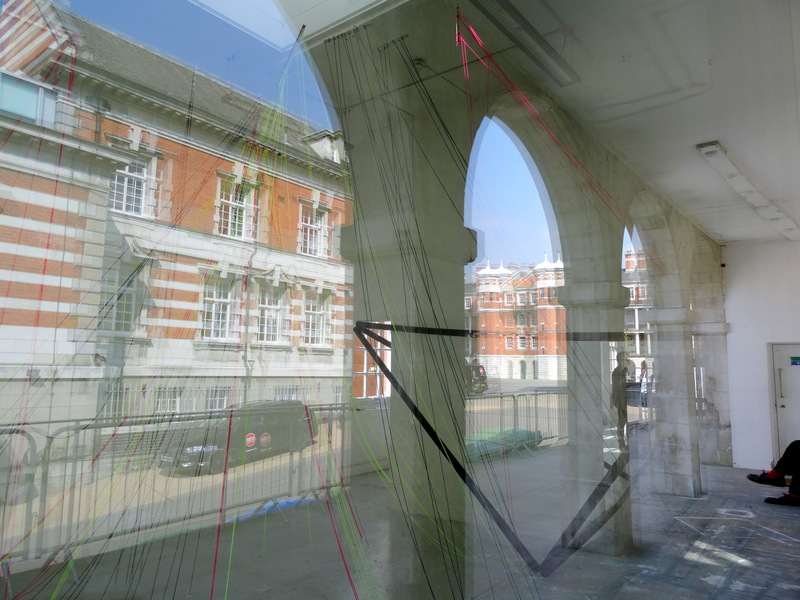 Installation view of ‘Housed:’ at Chelsea College of Arts, London. Photo credit Kelise Franclemont. In the first phase of Housed:, the artists took on installation, without input from the curating group – who would see the show for the first time tomorrow [Wednesday 8 April 2015] just prior to re-curation/re-hang of the work. There was a great variety of works, all linked to the overall remit in some way, that is, related to the theme of Housed: as well as considering that the work may be re-“housed” mid-way through the project. Overall, there seemed to be a strong cohesion between the works, all conversant with the nearest pieces in some fashion, with a strong sense of unity and flow overall.